Tags: Justin Ames, Photos Of The Day, Ukraine. Bookmark the permalink. Previous post ← What is Heavy Water? This is actually just outside Kiev in the museum commemorating the Great Patriotic Fatherland War. This is the museum with the huge titanium statue of “Motherland” outside. All through the museum, they do interesting things with objects suspended from the ceiling. That includes German greatcoats, Russian tunics and the traditional peasant dresses of the Ukrainian women. Each is suspended in a sweeping, fleeting sort of way that captures a strange melancholia. Concerning this photo, the lighting creates an incredible effect to persons walking though the display hall of these weapons floating suspended. 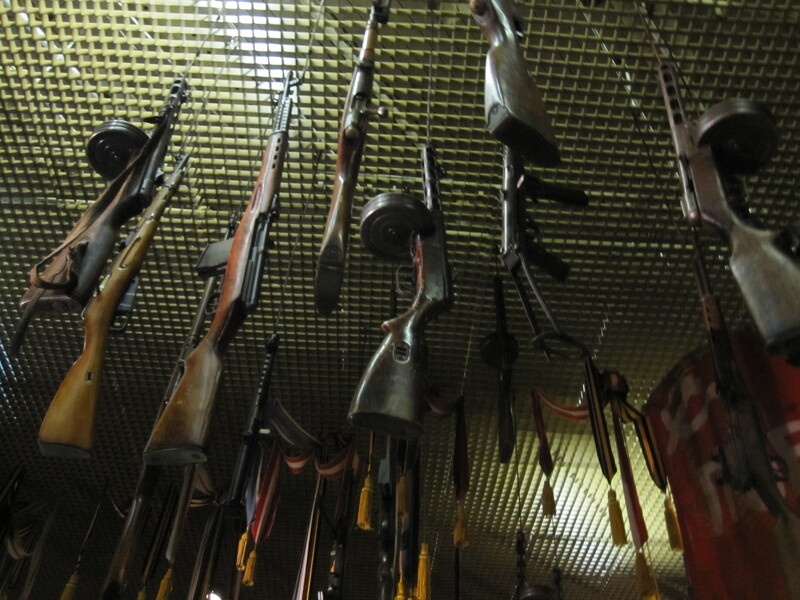 In memorabilia alone, there is millions and millions of dollars worth of weapons and uniforms, but the way the museum presents the war as an event affecting living people is both poignant and not something usually found in Soviet-era museums. If you’re ever in Kiev, plan on a full day there! You’ve got a good eye, Elvis. That is indeed exactly where this photo was taken and you’re absolutely right in endorsing this museum. It’s a damn good one.